January 14, 2018 – Oak Cliff husband and wife duo Kendall and Alicia Spence are launching a fresh entertainment destination in West Dallas: Another Round, an indoor miniature golf and bar lounge, is debuting this spring at 660 Fort Worth Avenue, the new creative dining and retail space by development company Oaxaca Interests. The concept of Another Round was developed with co-founders and fellow Oak Cliff residents Marcus and Charmaine Oladell. 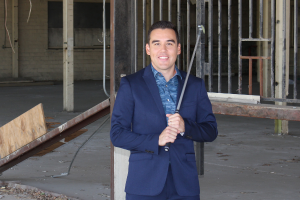 Designed by Oak Cliff resident Patrick Craine, founder of architectural firm Practice, Another Round will feature an interactive atmosphere that seamlessly fuses the bar lounge and mini golf areas together. Another Round will continuously update its themes to keep the 12-hole course fresh for customers. The first installation, “Oak Cliff Country Club,” will be a whirlwind take on the traditional setting. The Spence’s plan to hire local managers to oversee Another Round’s operations on a day-to-day basis. “The flexibility of 660 makes it the ideal venue for miniature golf and several other smaller retailers and food artisans. It was important to us that we tied the project into the existing neighborhood’s dynamic and complemented the tenants at our neighboring Sylvan | Thirty development,” said Brent Jackson, President of Oaxaca Interests.